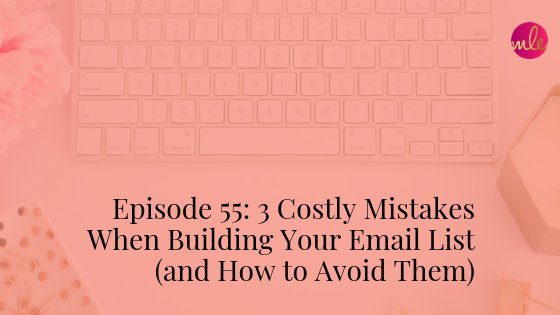 If you’ve ever looked at building an email list, you’ve probably heard someone say, “The money is in your email list, so focus on growing a big list, and you’ll be set.” Saying this is a lie might be a bit strong, but we can definitely call it a half-truth because there are several mistakes you make when building your email list that render it ineffective — no matter how big it is. A product, program, or service to sell. A way for people to buy that product, program, or service. An audience who wants to buy that product, program, or service. It’s business 101. Sell something that people want to buy. That’s where this well-intentioned advice starts — you want an email list of people who want to buy your product, program, or service. Too many people just focus on the opt-in to grow their email list. They focus on getting as many subscribers as possible without thinking about what happens AFTER someone joins. Getting them from stranger to an eager buyer certainly doesn’t happen by them just downloading your latest freebie. It takes a whole lot more than a stellar freebie to get people committed to your big offer. Back in 2013, I bought into this advice. I set out to build a big email list — and to do it fast. I pitched myself to a bunch of big-name blogs as a guest blogger, and the first big name to say yes was Brazen Careerist. I wrote a blog post that did well, and within a couple of weeks, around 4,000 people had downloaded my freebie. Of course, I was thinking “YAY, ME!! !” I mean, my email list was growing super fast so clearly what I was doing was working. But, alas, that wasn’t quite the case. Even though people seemingly flocked to my freebie, and I now had that coveted audience boom, something was off. Many people unsubscribed immediately. They got the freebie and ran (ugh!). Many others stuck around, but they never opened another email from me (double UGH!). The rest? They forgot who I was and would ask why I was emailing them (triple UGH!!!). It was 100% my fault that these people joined my email list only to ignore me, but I didn’t realize it at the time. A big email list is useless if the people on it don’t remember why they wanted to get emails from you in the first place. That lesson is what makes me want to save other people the frustration, time, and money that my ignorance cost me so that they can build a thriving email list that not only WANTS to hear from them but also wants to buy too. Want to know how to get lots and lots and lots of people on your email list quickly? Run a contest and give a prize that anyone will want, like a $1,000 Amazon gift card. You’ll get oodles of people signing up, and your email list will surge fast. 99.9% of those people only want one thing from you: that gift card. These same people will then ignore you, your business, and your offer. But the Gift Card Effect ALSO happens when our freebies are too general. If our freebie doesn’t set the stage for the offer we want to eventually sell our audience, it’s a bad giveaway. This was a big part of my own mistake with that Brazen Careerist freebie. The freebie that I offered was called 5 LinkedIn Headline Hacks That Rock (Even if you’re not looking for a job). Literally, any adult on the planet with a LinkedIn profile could put that freebie to use! And 4,000 Brazen Careerist readers signed up to get those rocking headline hacks. Were these people who had their own businesses or even wanted to have their own business? Nope. Were these people who would be interested in hearing about marketing and growing a business? Nope. Were these people who would eventually want to buy marketing services from me for their business? Nope. Never. These were people with LinkedIn profiles who wanted a headline hack to stand out. Period. So they opted in to get that freebie and then wondered why the heck I was talking about marketing and growing a business. It was the wrong audience combined with a generic opt-in, so this created a complete disconnect. Looking back, it’s so easy to see what went wrong when I break it down, and I know now that it’s a very common list building mistake. The bottom line is you shouldn’t focus on attracting anyone with a pulse to your email list. Focus on attracting the RIGHT audience and grow from there. What happens when someone subscribes to your email list? They go to the thank you page. You tell them to go check their email. They go to their inbox, seldom to be seen again. Most online businesses do the EXACT same thing, and what’s even worse is that most online marketers TEACH you that strategy to get your audience trained to open your email. But you know what? That is a HUGE mistake. You might as well be dropping them off a cliff, because the second they dive into their inbox, they’re lost in the email inbox pit. Once that inbox is open, they’re going to forget all about the conversation they wanted to have with you. That inbox will distract, disengage, and redirect their attention. I did this EXACT same thing with that Brazen Careerist freebie. What a conversation stopper, huh? It would’ve been so easy to keep the conversation going with a question, a resource, or even a teensy tiny offer so that the people who were ready to move forward with me could take that next step. Instead, I slammed the virtual door in their face by sending them to their inbox pit where they were basically lost forever. This one act would’ve made all the difference in people seeing ME as a person they wanted to learn from versus just another huckster on the Internet streets trading freebies for emails. Don’t make that mistake. Keep your virtual door open and invite your new subscribers to continue the conversation so that they see YOU as the expert they need. I’ve lost count of how many times I’ve heard someone say they don’t want to “bother” their subscribers with too many emails. In my experience, what they’re really saying is that they don’t know what to say to keep their audience engaged in a conversation. Then, because they don’t how to create an email journey to engage, educate, and enthrall their audience with stories, examples and a-ha moments, their email series becomes a hodge-podge of random acts of email. Random acts of email don’t engage, educate, or enthrall anyone. That’s why it’s SO important to have a freebie that solves a specific problem for your audience because then you know exactly what conversation to have with them. Think about this for yourself. When you have a problem, what do you do? You probably Google it, right? I mean, just last month, my cat peed on a leather chair we have in our formal living room which, of course, is so annoying. I tried the normal stuff to clean the stain, but it wasn’t working, so what did I do? I hopped on Google to see if I could find some hacks for getting rid of the smell quickly, and I found a TON of options. I ended up buying a few to test them out and, thankfully, I found a winner. Now, that’s a super simple example for a pretty low-cost purchase. Let’s switch this up and think about your audience. What’s their cat pee moment that gets them to jump on Google? And what are they Googling? This is the key to having a successful online business. What is that problem you’re solving for your audience? There’s actually a lot of research about buying behavior that’s been done to back this up. What has been found by researchers across different types of businesses are that 70% of online buyers are buying to solve a specific problem. This should tell you that it’s mission critical that you know the problems your audience has and to speak to those problems if you even want a shot at getting people to buy from you. And here’s the biggie: 95% of online buyers buy from the business that offers relevant content at every stage of their buying journey. That statistic is EXACTLY why you need a strategic marketing funnel and to stop doing random acts of email that lead your audience to ignore you. Instead, start having a strategic conversation with your audience about the problem they want to solve. Not only will you attract more buyers, but you’ll also create an engaged audience who knows EXACTLY why they want to buy from you. Now that you know three costly mistakes when building your email list, I’ve created a detailed, free cheat sheet to help you make a profitable list building funnel that will attract, engage, and convert the RIGHT audience with proven, non-sleazy strategies. I don’t want you to make the same costly, frustrating, and business-killing mistakes that I made. Instead, discover how to create a SIMPLE funnel that will help you build an email list of the right people who know why they want to buy from YOU. I’ve been building marketing funnels for years now, and one of my biggest mistakes was not understanding that I needed to set the stage before ever having a shot at starting a sales conversation with my audience. Click here now to get the your cheat sheet.